On Saturday the 8th December we are holding the last Misty Moon gig of 2018 at the award winning Cinema Museum in Kennington. 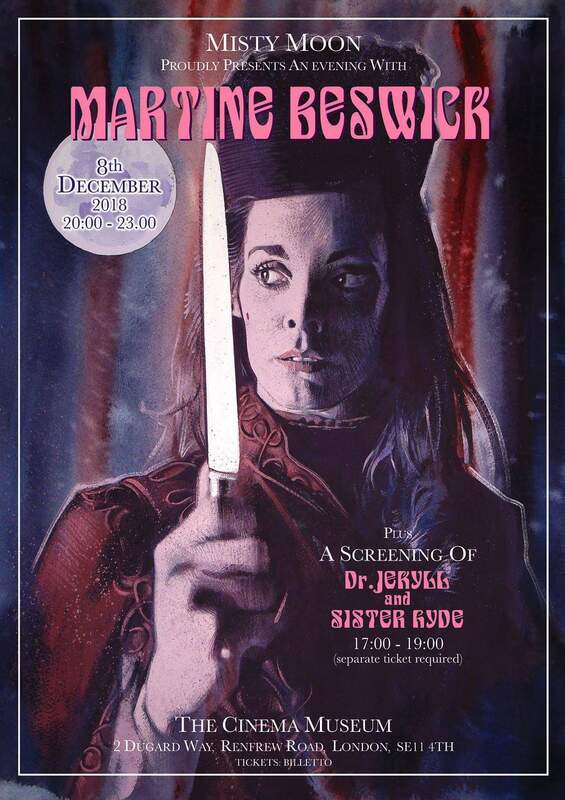 An Evening With Martine Beswick, with a special screening of Doctor Jekyll and Sister Hyde before the main event. This exclusive painting has been designed to celebrate the event by the celebrated artist Graham Humphreys. Graham has printed a limited run of 30 A3 copies of the print that will be signed by both himself and Martine and available on the night. From the people that brought you “The Landlady” Robo Films presents “Lost Soul” a micro horror starring Bond Girl Nina Muschallik and introducing Alicia Doe. Filmed entirely on location at Brockley cemetery in November 2015. A fabulous film written and directed by Jason Read. Premiered on Saturday the 13th February at The Cinema Museum as part of a retrospective of work by Robo Films and Rory O’Donnell, Lost Soul has a slight nod to Friday the 13th………..
A very special message by Hammer and Bond Babe Caroline Munro, recorded during An Audience With Ken Foree at The Cinema Museum on Thursday the 9th July. Video recorded and edited by Jason Read of Robo Films.